Bonnie Bramlett is an American singer, best known for the husband-and-wife duo Delaney & Bonnie and Friends which was active from 1967 to 1972. 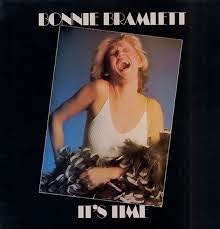 Bonnie Bramlett's second solo album came out in 1974 on Capricorn Records, home of The Allman Brothers Band and many other southern rock acts. Among the cast of backing musicians could be found members of the Allman Brothers (Gregg Allman, Butch Trucks and Chuck Leavell all appear), members of the band Cowboy (another Capricorn act), and guitarist Eddie Hinton. Songs included the title track by Scott Boyer of Cowboy, a couple from Hinton, "Cowboys And Indians" by Bobby Charles, Gregg Allman's "Oncoming Traffic", Ivory Joe Hunter's "Since I Met You Baby" and Jackie Wilson's "Higher And Higher". The result was a fantastic album of Southern rock / R&B, with Bramlett's soulful vocals front and center throughout.